Need some ideas to spice up your kindergarten ESL intervention time? I'm sharing some 20 minute listening and speaking activities that I use with my kindergarten ELL students. I pull my kindergarten ELL's out of classroom for 20 minutes in the morning, while the rest of the students are doing their morning work. During that time, I focus mostly on listening and speaking skills, since their phonics and reading instruction takes place in the mainstream classroom. Here are some ideas to get your kinder kids listening and speaking! We start our lesson the exact same way, every single day. Even if I've already said hello to the students, I say hello again and ask how they're doing. By doing that, I'm creating the expectation to respond in full sentences, as well as enforcing the societal norms of responsing to greetings. As the students become more proficient, I add to our daily questions by asking what they had for breakfast/lunch, or what they did the night before. We then move into a warm-up game such as picture Bingo, which takes about 5-7 minutes to complete. Picture Bingo is one of my kids' favorite, if not THE favorite game to play. It improves vocabulary and speaking skills, teaches game-playing skills and reinforces those social norms that many students are missing. The game often starts out as a teacher-directed activity, but as students gain proficiency, they take ownership and begin calling out the names on the cards themselves. In the beginning, when students have very low proficiency, I tend to stick with flashcards for direct instruction. There are SO many ways to use flashcards. We can describe attributes, listen and point, and discuss likes and dislikes. That's just a few! I like to use cards that are seasonally appropriate, as well as objects they're interested in. As students gain proficiency, I teach them to use 10 Finger Sentences to describe a picture or prompt. We also use some iPad apps, but I am very picky about what apps I use for instruction. Many apps have "robot voice" narration and dictation, which is not the fluent speaking I'd like to model. One app I do like for kindergarten language learners is the English First High Flyers Game. Students learn 5 related words at a time, then take a short quiz to assess. Another one my kinders love is the Disney Princess Story Theater app, where you can move the princesses around, add accessories, and then narrate a story and play it back. My little girls love it! The younger boys love it too, but for older kids, I'd recommend the Sock Puppets app. You can save your stories and play them back- what a great way for kids to hear their progress! There are lots of possibilities for creating speaking and listening tasks, too. We will also use whiteboards and dry erase markers to play a modified pictionary game. I'll show a card (secretly) to one student, who starts to draw the picture. The others try to guess the name of the card. That's a fun game for warm-up or review, too! We usually end with a GoNoodle activity or a youtube video. The movement helps my little kids get their wiggles out, and they are great for listening skills! ELF Kids Learning channel is my favorite, hands down. We also love to do the Starfall Head, Shoulders, Knees and Toes video- great for practicing the tricky /s/ sound at the ends of words, and it's quite a challenge! While I introduce new activities, songs, or videos every few days, our general intervention time runs as you read above. Having a structure and routine really helps my students to stay focused and on task, and helps to establish a safe space for trying to speak. 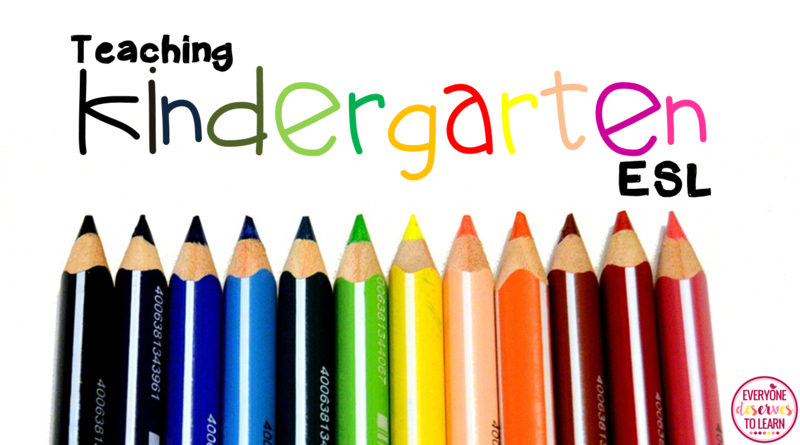 If you're interested in more kindergarten ideas, check out my pinterest board! I found your blog two weeks ago while looking for a newcomer ESL curriculum. I have spent the last two weeks going over your entire blog and it makes me both happy and sad. 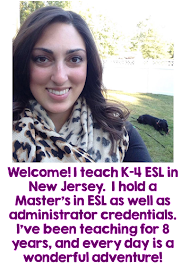 It is so hard to find blogs focused on ESL, especially programs that have lessons for less than an hour a day. I feel so envious of those teacher as I teach my kids for 30-45 minutes twice a week. However, you are going to be moving on to something that makes you happy: admin. I will be following your blog until it stops being useful to me, because one can never have too many proven ideas about how to work with low level ELLs. Thank you for your efforts. Hi, thank you so much for your kind words! I'm so glad you have found ideas to help you. Lots of free downloads, ideas, activities. Join me at my Facebook Group: ESL/EFL Preschool Teachers and post a link to your blog. I am sure many teachers will love this.